There are '3' verbs which are given the name 'auxiliary verbs' in English. This is because they are used to construct other types of sentences, tenses, and questions. We will look at the verb 'DO' to begin with. Do = I, you, we, they - They do aerobics three times a week. Does = He, she, it. - She does the cooking at home. Did = past simple. - We did our homework last night. Do is also used to create Yes/No questions with a main verb. Does she work at the Post Office? Did she go to work yesterday? Do is also used to create information questions. Why does she keep dating him? Do is also used with certain tasks or activities. 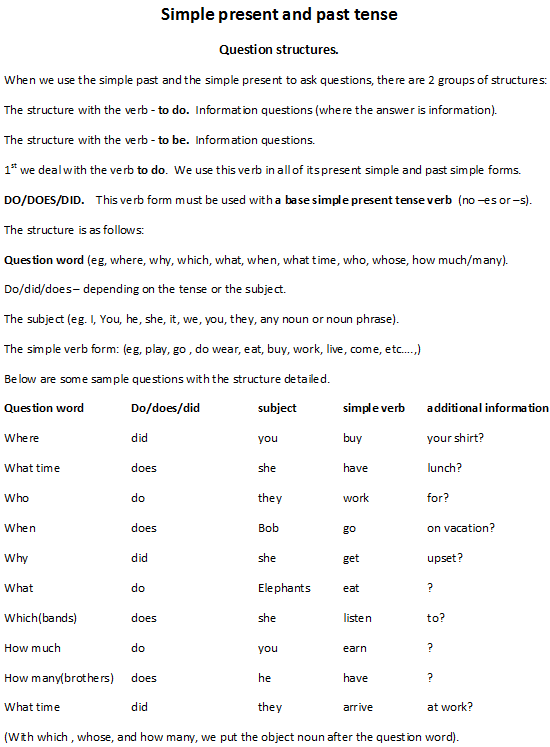 Read the explanation of how to use the verb 'DO' when creating information questions. The verb 'to be' is the most used verb of the 3.
to make continuous tenses, and more. To identify things - "His name IS Bob"
To talk about states - "The bank IS closed"
To make passive tenses - Houses ARE built from bricks. To make continuous tenses - He IS doing his homework. To be is also used with adjectives when the form Noun is Adjective is used. Bob and Jean are married. They were in London last week. Susan was eating lunch when she got a phone call. Peter has been working here for 5 years. If you need me I will be in the living room watching TV. They said that they will have been married for 10 years on September 1st. I might be late for work tomorrow. He should be at home now. Try his number. Global warming can be reduced. Something must be delaying him. He is never late for work. 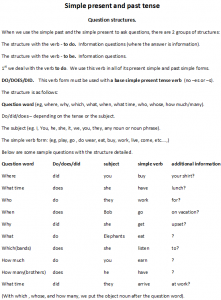 Here are some worksheets to practice the verb structures. Our final verb in this section is the verb HAVE. Another 'flexible' verb, it is used in many situations. To create 'possession' when used with nouns. The verb have has three forms: has, have and had. The forms has and have are used in the present tense. Had is used in the past tense. Use have when the subject is a plural noun. Have is also used with the pronouns I, we, they and you. They have a nice apartment in the city. You have a sweet voice. Use has when the subject is a singular noun or the third person singular pronoun (e.g. he, she, it). My father has a flat in Chennai. Rohan has a brother and a sister. The elephant has a big trunk. As a primary auxiliary, have and its forms are used to show ideas such as possession, relationships, physical sensations etc. Have can also be used as a modal auxiliary verb. As a modal auxiliary verb, have is used to make perfect tense forms. As an auxiliary verb 'have' also has the following use. This is to mean 'obligation'(no choice) We also use 'must' to express the same meaning. In Korea, men have to do military service. To travel abroad you have to have a passport. Use the following worksheet to practice using 'have to' & 'must' as modal verbs. The other uses for have will be covered in other lessons. How to use the continuous tense to talk about the future.